2016. What a year. No matter where you stand or what your aspirations are, 2016 felt bleak and sad to a lot of people. We lost many beloved heroes, and no matter where you looked, optimism was in short supply. It seems entirely fitting that our winning nominees for 2016's game of the year are all really dark, grim titles. 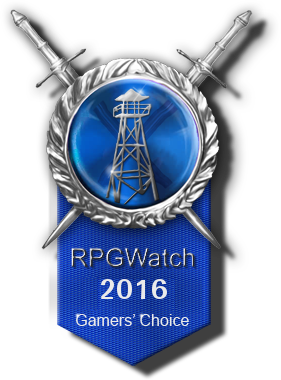 And in a year of shocking surprises and dying optimism, the consensus among gamers seems to be that 2016 was weak for RPGs as well. In the running for this year's best games, the entry that came in first was..."none"! 12.9% of voters told us that they simply didn't feel that any one title was strong enough to take the prize this year. This speaks very loudly indeed; whether it means that 2016's offerings were watered down and lackluster, or that they merely paled in comparison to the smash hits of the previous year...that's something every gamer must answer for themselves. Regardless, next to "none at all", the very next title to get the most votes was Obsidian's Tyranny, at 12.5% of the popular vote. Since it's hard to give an award to nothing at all, we'll start there. 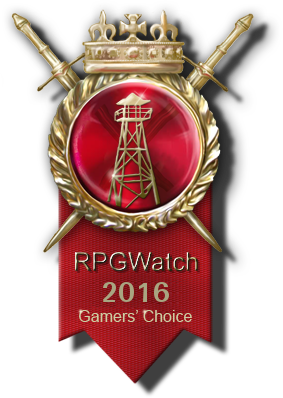 The RPGWatch editors could not reach a conclusive vote on Best RPG, there were simply not enough votes and besides that the results were so diverse that there was not a clear winner, let alone a Top-3. Tyranny was Obsidian's follow-up to the smashing success of Pillars of Eternity. It was another world of breathtaking beauty and dark ambiance from Feargus & co., designed to tell a story only Obsidian could tell. Emerging from the ashes of a much older Obsidian IP, this grim tale of victorious evil has finally seen the light of day and became your game of the year, despite a relatively indifferent reception from the RPG world at large. Here's to Obsidian. You've done amazing things, and we can't wait to see Pillars of Eternity II. The final release of Grim Dawn felt a bit anticlimactic; many would agree that there was never any point during its long early access period in which it did not feel like a masterfully-built, fully accomplished action RPG. Its release merely confirmed to the world what its fans had long been saying - that Grim Dawn was the modern successor Diablo should have had. Gruesome scenery, dark magic, loathsome creatures, and terrible carnage are hallmarks of the genre and are things that Grim Dawn offers countless hours of. Add all this to a satisfyingly long playtime and you get a title fully worthy of the praise it has received. The best-selling Dark Souls III was received as enthusiastically on PC as it was on consoles, making it one of the year's most recognizable titles. It offered more of what its fans had come to expect from the series - a dark plot, even darker scenery, and brutal, unforgiving gameplay. The Ashes of Ariandel DLC introduced a frosted, snow-laden landscape to the game, delivering equal measures of surprising beauty and punishing combat. Dark Souls III was our audience's third most favorite game for 2016. The following table show the results of the voting by our visitors.